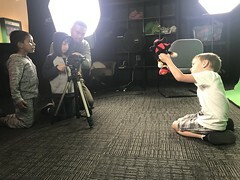 The Digital Gym is a multi-purpose community space in North Park managed by the Media Arts Center San Diego, a 501(c)(3) non-profit organization committed to providing filmmaking tools and media education to under-resourced communities in an effort to create social change. Learn more about the Media Arts Center San Diego at mediaartscenter.org. THE DIGITAL GYM is dedicated to engaging neighborhoods in community self-expression via new technologies through an independent movie theater, a store with digitized products, media experiences and hands-on media programs. Explore the wonder of MEDIA ARTS in your own neighborhood. Get your friends, bring your family, and meet your neighbors as we provide content for your 21st Century lifestyle and establish a new wave of digital arts experiences in local communities. Your #1 home for one of a kind foreign & independent movies. The Digital Gym CINEMA is a unique 46-seat art-house theatre specializing in first and second run independent films that would otherwise never be shown in San Diego. Our movie theater offers state of the art digital projection and crystal clear audio. New films are rotated every week and film programming varies. The Digital Gym is also home to various WORKSHOPS, including Media Arts Center San Diego’s Teen Producers Project and Youth Media & Tech Camps. Students use our Computer Labs to edit their projects. The computers come equipped with Final Cut X, iMovie, and Adobe Premiere. Our Labs are available to Members of the Digital Gym for varying time intervals depending on membership levels. A great space to relax before a film, enjoy a drink from our concessions desk, or host a private event. Please call 619.230.1938 ext. 107 for space rental inquiries. A place offering a wide selection of products including concessions, tech gadgets, collectibles, greeting cards, blu-rays, pins, vinyls, hard to find DIY (do-it-yourself) technology, and many other items.